Most of the thirty-four papers contained in this Special Publication arise from the Fourth International Conference on Fluvial Sedimentology held in Spain in 1989. 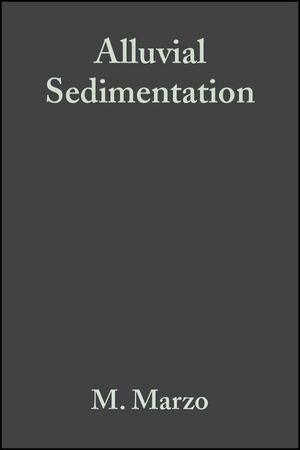 Sections deal with various aspects of sediment transport and hydraulics in flume experiments and modern rivers, the analysis of alluvial facies, geomorphic and structural controls on alluvial sedimentation, alluvial stratigraphy and basin analysis, and finally the exploration and exploitation of ores. A professional reference to the most recent research in fluvial sedimentology. M. Marzo is the editor of Alluvial Sedimentation, published by Wiley. C. Puigdefabregas is the editor of Alluvial Sedimentation, published by Wiley. Entrainment Of Spheres - An Experimental Study Of Relative Size And Clustering Effects. A New Bedform Stability Diagram, With Emphasis On The Transition Of Ripples To Plane Bed In Flows Over Fine Sand And Silt. In-Transport Modification Of Alluvial Sediment - Field Evidence And Laboratory Experiments. Bed Material And Bedload Movement In Two Ephemeral Streams. Bedform Migration And Related Sediment Transport In A Meander Bend. Sediment Ice Rafting And Cold-Climate Fluvial Deposits - Albany River, Ontario, Canada. Dynamics Of Bed Load Transport In The Parseta River Channel, Poland. Morphology And Facies Models Of Channel Confluences. Interpretation Of Bedding Geometry Within Ancient Point-Bar Deposits. Geometry And Lateral Accretion Patterns In Meander Loops - Examples From The Upper Oligocene-Lower Miocene, Loranca Basin, Spain. Alluvial Ridge-And-Swale Topography - A Case Study From The Morien Group Of Atlantic Canada. Processes And Products Of Large, Late Precambrian Sandy Rivers In Northern Norway. Crevasse-Play Sandstone Geometries In The Middle Jurassic Ravenscar Group Of Yorkshire. Grain-Size Distribution Of Overbank Sediment And Its Use To Locate Channel Positions. Geometrical Facies Analysis Of A Mixed-Influence Deltaic System - The Late Permian German Creek Formation, Bowen Basin, Australia. Computer Modelling Of Flow Lines Over Deformed Surfaces - The Implications For Prediction Of Alluvial Facies Distribution. 3. Geomorphic Controls On Alluvial Systems:. Geomorphic And Structural Controls On Facies Patterns And Sediment Composition In A Modern Foreland Basin. Quaternary Alluvial Fans In Southwestern Crete - Sedimentation Processes And Geomorphic Evolution. Palaeomorphological Controls On The Distribution And Sedimentary Styles Of Alluvial Systems, Neogene Of The NE Madrid Basin (Central Spain). Alluvial Fan Sedimentation Along An Active Strike-Slip Fault - Plio-Pleistocene Pre-Kaczawa Fan, SW Poland. Present-Day Changes In Hydrologic Regime Of The Raba River (Carpathians, Poland) As Inferred From Facies Pattern And Channel Geometry. A Revised Alluvial Stratigraphy Model. Quantified Fluvial Architecture In Ephemeral Stream Deposits Of The Esplugafreda Formation (Paleocene) Tremp-Graus Basin, Northern Spain. Architecture Of Cañizar Fluvial Sheet Sandstones, Early Triassy, Iberian Ranges, Eastern Spain. Effects Of Relative Sea-Level Changes And Local Tectonics On A Lower Cretaceous Fluvial To Transitional Marine Sequence, Bighorn Basin, Wyoming, USA. Structural And Climatic Controls On Fluvial Depositional Systems Devonian, East Greenland. Alternating Fluvial And Lacustrine Sedimentation - Tectonic And Climatic Controls (Provence Basin, S France, Upper Cretaceous/Paleocene). Control Of Basin Symmetry On Fluvial Lithofacies, Camp Rice And Palomas Formations (Plio-Pleistocene), Southern Rio Grande Rift, USA. Simultaneous Dispersal Of Volcaniclastic And Non-Volcanic Sediment In Fluvial Basins - Examples From The Lower Old Red Sandstone, East-Central Scotland. Siliciclastic Braided-Alluvial Sediments Intercalated Within Continental Flood Basalts In The Early To Middle Proterozoic Mount Isa Inlier, Australia. Sedimentological Response Of An Alluvial System To Source Area Tectonism - The Seilao Member Of The Late Cretaceous To Paleocene Purilactics Formation Of Northern Chile. Cyclicity In Nonmarine Foreland-Basin Sedimentary Fill - The Messinian Conglomerate-Bearing Succession Of The Venetian Alps (Italy). The Impact Of Incipient Uplift On Patterns Of Fluvial Deposition - An Example From The Salt Range, Northwest Himalayan Foreland, Pakistan. Principles Of A Sediment Sorting Model And Its Application For Predicting Economic Values In Placer Deposits.